David Morris Williams was born in Penrhyndeudraeth in 1884 to Evan and Catherine Williams, writes granddaughter Carol Foster. Evan was a slate quarryman. After leaving school, David became a tailor. In 1915 he married Jane Williams, daughter of a ship’s carpenter, at Tabor chapel in Pentrefelin. They lived in the Ffestiniog Railway station house at Porthmadog. Their son David Glyn was born there in December 1916. During the First World War, David Morris Williams served in the Mercantile Marine. 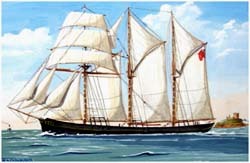 He was ship's cook on a Caernarfon-registered sailing ship called Ellen James (pictured right in a painting by Robert Cadwaladr). 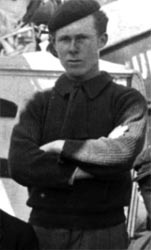 He was lost at sea on 3 April 1917, aged 32, after the ship was sunk by gunfire from German submarine UC71 in the Bay of Biscay. The crew were given a chance to leave the sinking ship but their lifeboat was overwhelmed by the sea that night, leaving only one survivor. David’s body was never recovered. He is commemorated on the Tower Hill Memorial in London.